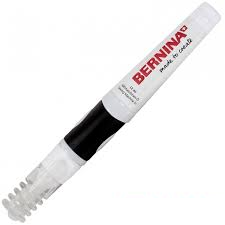 Regular oiling of your BERNINA 8-series machine (or any other sewing machine!) will ensure proper operation of your machine. This special oil allows the 8-series bobbin to spin easily and maintain thread tension. The pen is designed to easily apply a single drop of oil to the correct spot on the bobbin case.